I missed it last week because I was on my way back from FETC 2015 in Orlando. But, I'm back at it this week! We are still "ears-deep" in ACCESS testing here in Maryland. Each one of our district's nearly 20,000 sweet ELLs has to have their English language proficiency tested by February 13. As a coach in the central office, we go out to support testing in schools who have teachers on medical leave or who don't have positions filled. So....testing, testing, testing. On February 9-10, I'll be presenting on ELLs in the PreK/K classroom at SDE's Maryland PreK/K conferences. If you'll be there, please stop by and say hi or attend my session! Finally, I have to go grocery shopping because we have almost nothing to eat in the house. Maybe I'll give myself a break and just order grocery delivery online this week. As far as things I hope to do, I'm really not asking much- get a little nap this afternoon since I didn't sleep well last night and just stay sane through this next week. 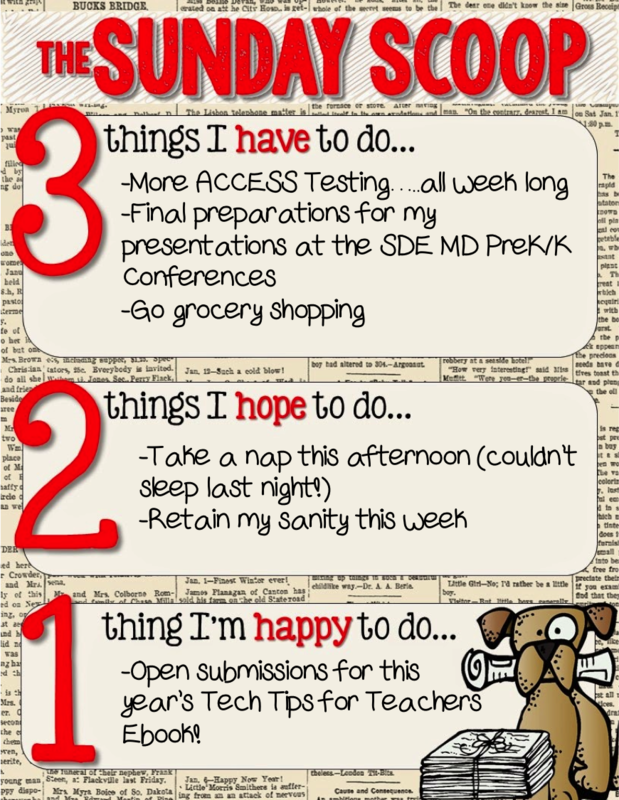 For what I'm happy to do- I opened submissions THIS MORNING for the Tech Tips for Teachers Ebook 2015! I'm thrilled and can't wait to see what this year's books will look like. So that's it....the Sunday Scoop. If you're interested in what other teachers are doing, head on over to the Sunday Scoop Link-up at Teaching Trio! Definitely order online! I have no food in my house either but a takeaway tonight has see me through and shopping will be delivered tomorrow!